One of Natchitoches’s true treasures, Carolyn “Conna” Mizell Glass Cloutier, 84, died peacefully in her bed at home early Wednesday morning, Oct. 24, 2018, after a brief illness. A lifelong resident of Natchitoches, she was for decades one of the brightest stars of the City of Lights. Conna was preceded in death by her father, Garland Burrell Glass; mother, Ola Mizell Glass; sister, Martha Anne Glass Young; brother-in-law, David C. Young; her former husband, Peter E. Cloutier Jr.; and dear friend in her later years, Sam Nelken. She is survived by daughters Melissa Manette Cloutier and Martha “Marcie” Michelle Cloutier; nephew, David C. Young III and his wife, Mardell HartYoung; and great nephew, D. C. Young IV, all of Natchitoches. She leaves behind a clan of close friends, many of whom she regarded as family, to mourn her loss and to cherish her memory: Marsha and Monty Brown, Connie Anne Keppinger and J. Michael Kenny, Frank and Judy Douglas, Dian and Fraser Snowden, Coco Lee, Joanna Cassidy, Juanita Murphy, Ann Manger, her faithful bookkeeper Betty Durr (who, Conna would jokingly say, “kept me out of jail for 35 years”), and many others too numerous to name. She spoke of many of her much younger friends as “adopted” sons and daughters. Conna was born in Natchitoches Aug. 5, 1934. She graduated from Natchitoches Central High School and attended Northwestern State University. She was a devoted mother to her beloved daughters, Melissa and Marcie. Embracing the values of social justice, equal rights for women and minorities, and compassion for the needy, Conna was a proud, lifelong, and outspoken liberal Democrat. She had an enormous zest for life. She loved movies, theater, art, good food, music, gardening, intelligent and animated conversations with friends, travel, Natchitoches history and culture, and animals. She was an unconventional entrepreneur. After taking an active role in restoring Ducournau Square on Front Street, she opened one of the first B&Bs in Natchitoches—The Cloutier Townhouse B&B at Ducournau Square. Later, she operated The Cloutier B&B out of her home on Jefferson Street and managed The Petit Tarn Guesthouse on Williams Avenue. She was the co-owner of The Open Hearth Deli and Market at Ducournau Square, featuring products by famed Louisiana chef and restaurateur John Folse, who collaborated with her to make the restaurant a success. She was an enthusiastic and creative participant in the arts. Over the years she appeared in numerous theatrical presentations at Northwestern State University. She acted in many community theater productions directed by Ray and Myrna Schexnider, the most memorable being a spoof of “Gone With the Wind” performed at St. Maurice Plantation. As a member of the Lollygaggers, she and several other local women performed skits for school children throughout the parish. She was a member of a group that, under the aegis of the late Dr. Joe Bienvenu, built a marionette theater with elaborate sets and costumes and performed—to much acclaim—the final act of Puccini’s opera “Tosca” for the Shreveport Opera Guild. She was delighted to be involved in the filming of the movie “Steel Magnolias” by Robert Harling from his popular play depicting the strong-minded women of Natchitoches. Conna watched filming in front of Ducournau, some of the stars stayed in the B&B, and she was a prominent extra in the film. She also acted in the movie “The Garden Club,” based on the novel of the same name by former Natchitoches Mayor Bobby Deblieux. During the American Cemetery tour one year, she enacted the role of her mentor and another Natchitoches legend, Irma Sompayrac Willard. She was a fan and active promoter of local and Louisiana history, spending many hours discussing it with friends and B&B guests. She enjoyed treating her B&B guests to informative and entertaining guided tours of the town and points of interest down Cane River to Melrose. She hosted authors, such as Laurent Charrier of France, doing research for books they were writing. She rescued and restored many original Louisiana antiques and art works from down Cane River, realizing their importance to Natchitoches’s cultural heritage. She was a member of the Association for the Preservation of Historic Natchitoches and, later, a founding member of the Natchitoches Historic Foundation. In 2017, she was awarded the NHF’s Bobby Deblieux Historic Preservationist Award for her contributions to the organization. 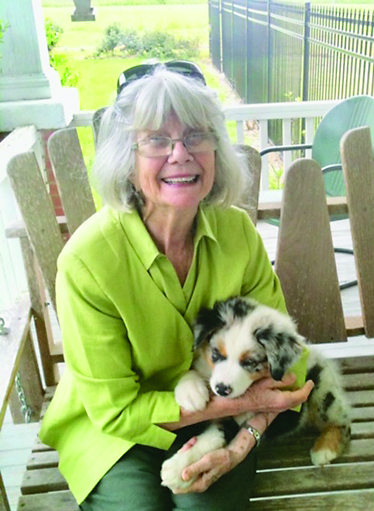 An avid animal lover, Conna was a member of the Natchitoches Humane Society. She rescued and fostered many cats and dogs, encouraging others to do so as well. Recently, she became especially fond of some pet chickens, to whom she gave names. A celebration of her life will be at 1 p.m. Saturday, Nov. 17 at the First Presbyterian Church with Pastor Sara Anne Berger as celebrant, followed by a reception at the church. Memorial donations in Conna’s name may be made to the Natchitoches Humane Society, P.O. Box 7405, Natchitoches, LA 71457; Natchitoches Hope for Paws, P.O. Box 2552, Natchitoches, LA 71457; or the First Presbyterian Church, 114 Bienville St., Natchitoches, LA 71457.